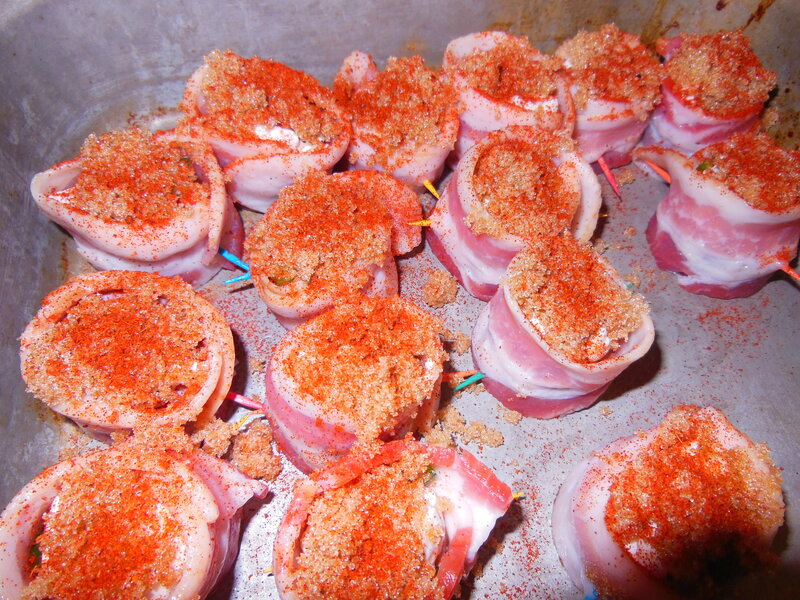 Canvassed the forum last week for recipe input - took the plunge this week and prepared Pig Shots for an appetizer. Nothing real complex - just followed the steps outlined here. These things are over-the-top very good - if you like sausage, bacon, and Cream cheese. I put some fresh Jalepeno chunks in the cream cheese, topped with Brown Sugar and some homemade rub a friend gave to me. One other note about prep. My standard "go-to" with larger groups for an appetizer has in the past been some variant of bacon wrapped jalepeno (insert filling here). This is so much less work assembling. Don't let the bacon strips get warmed up much. I used a piping bag for the filling. If I wanted 50+ appetizer servings - this would be the route I would go. They look amazing, I'll have to give them a try. I like ABTs but they're a pain to prep. Quick question from a newbie. What does ABTs stand for? Hmm. I did these and the prep was a disaster. I think I didn't buy thick enough bacon. Looks good! I looked for bacon that was at least medium thickness, as much lean as I could. Easier to wrap if the bacon is chilled. Noticed that once it started to warm, was much more difficult. Also - height of sausage is a factor, make sure it is at least halfway up the bacon. I use the Oscar Mayer Black label bacon at room temp. Very stretchable. I did some kielbasa shots yesterday. Boy those are great. Will make a slew of them next time around. Those look great! Nice job. 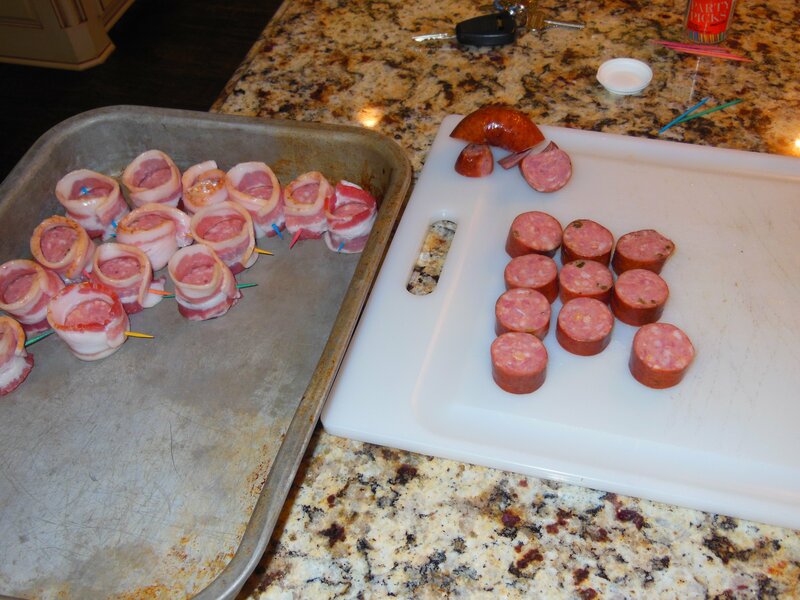 I would rate the level of work for the prep as in the middle between MOINK balls and ABTs. 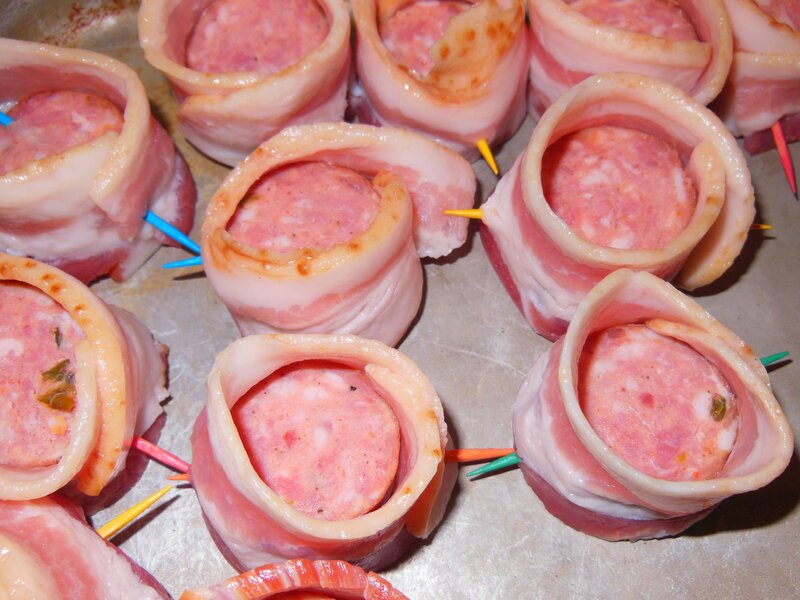 I believe those are bacon wrapped meatballs. 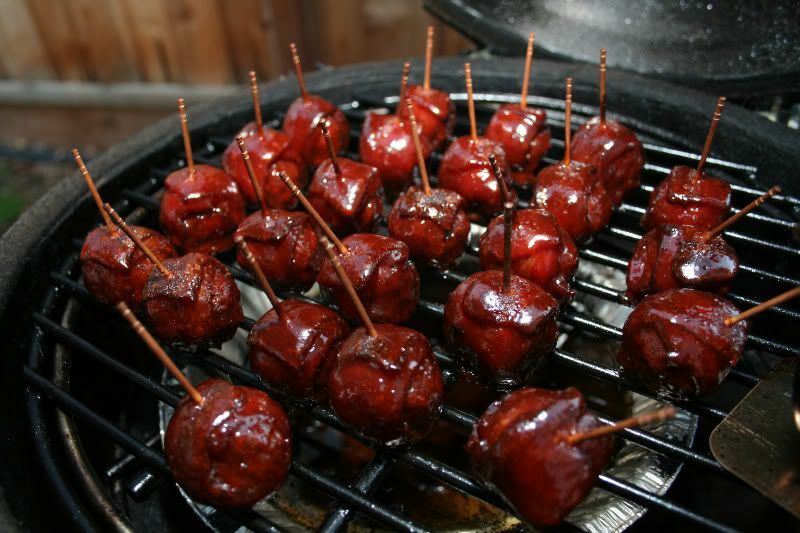 MOINK balls are bacon wrapped beef meatballs (usually the store bought frozen kind 1/2 oz ea size) dusted with rub, cooked in a similar fashion as the pig shots except they get dipped or brushed with BBQ sauce in the last few minutes. 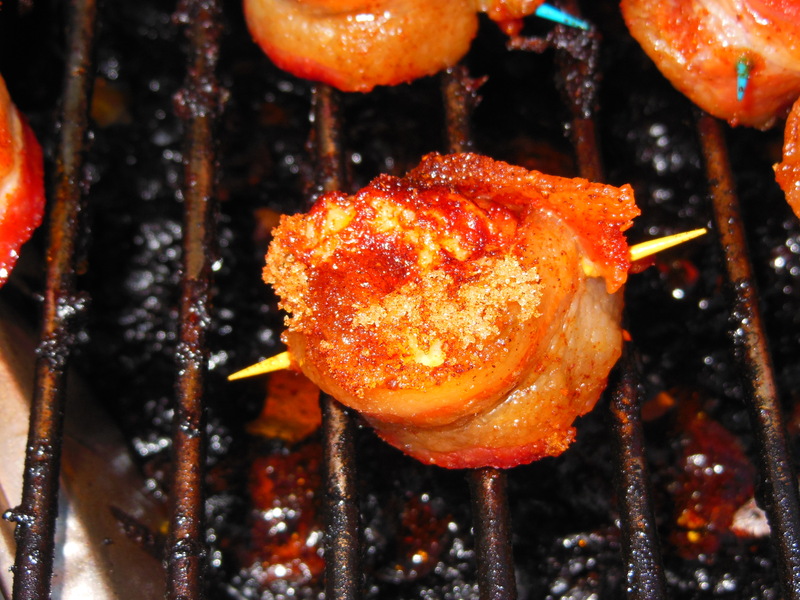 MOINK = "Moo" (beef meatball) + "Oink" (bacon). They're definitely easier to prep than pig shots or ABTs. 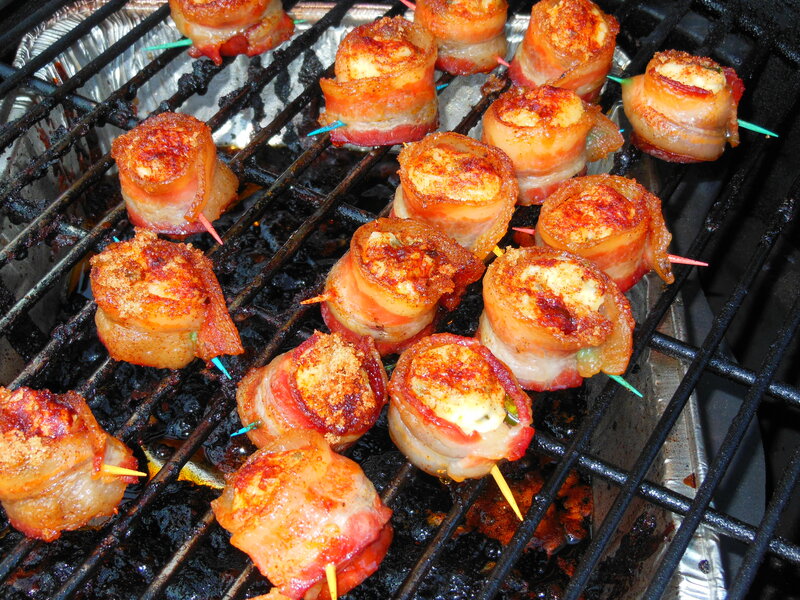 I prefer the range of flavors in pig shots better but these go very well as an appetizer. I haven't met a kid that didn't love them. Those look great! Did you do them in-direct? What temp and about how long did they take?